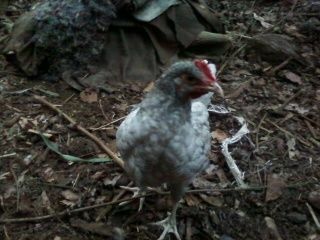 "Porce" (SC) was one of my first captures of feral Bantams that was running around my Coops. When I looked at her I was unsure of ther color pattern because she looks white but has blue instead of black in her tail, primary, and hackles. 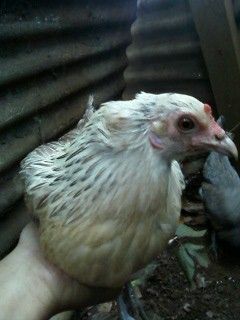 She had chicks with her but of the chicks Splash (SC) was the only survivor. She is very small in comparison to her mother and other pen mates. Plus she is the most sweetest little thing I ever did have. I spoil Splash because she is super tame and really independent when I let her out. Splash is literally a Splash colored hen. Blue(PC) is Porce's feral flock mate. She was caught with a semi-deformed foot and Bald head. She looks like she has a Moose antler on her head. Blue is a little skittish and likes to go broody when given the chance. She was caught with her two offspring Lemue (PC) and Silver (PC). 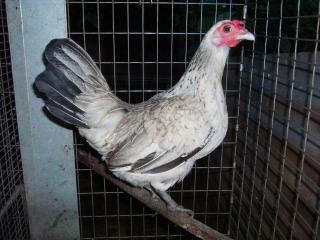 Lemue has a beautiful lemon color with blue primary and tail feathers. She is like her mom Broody when she gets a chance. When I was taking her photo she was attacking the camera phone. Silver looks exactly like a Silver Duckwing hen. I may change her to the pattern group later because she really isn't blue or banty. Lemue and Silver are medium stature to their mother Bantam size. Quil (SC) is the final Feral Flock mate to Blue and Porce. 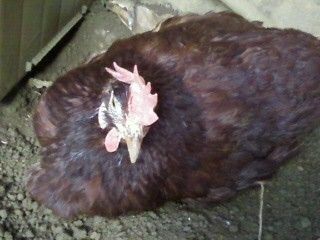 She has now feathers over her left ear when I caught her. But functions well and is quite tame and sweet like Splash. She is like a Silver Quail pattern. 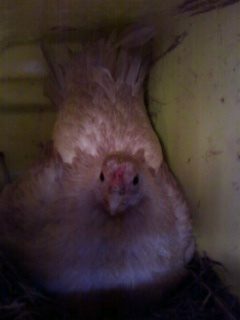 She lays pretty big eggs for her Bantam size and likes to eat treats when I have them. 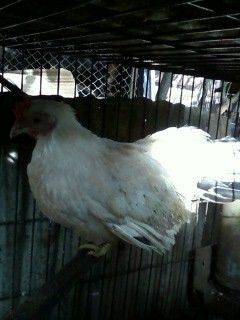 Banty(SC) is my favorite catch because she is a Black tailed White Japanese Bantam. Yes she was feral and a recent catch that literally was in my open run when I came out of my cages. I swear it is like someone threw her in there and left. She was under weight and now has meat on her bones again and back in lay. She is kind of dirty but will wash her when the weather gets better. For a banty, she likes to get muddy. This is not the greatest pic but I only just got sunlight again. R.J. is the progeny of Easterea(RIP) and R.C. 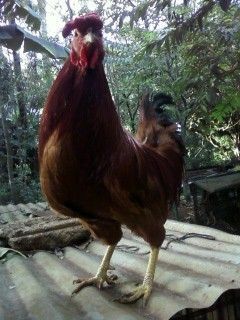 He looks like his uncles red with black tail, without any feathered legs, not like his dad. But is small enough to stay with this group cause he would never crush them when he mounts theses little girls. He definitely likes the larger gals and is able to breed them. I just hope that he has the mother's Blue egg trait, to pass on. But the likely hood is not high. But a keeper cause he is super sweet and very talkative and alert. I can't wait to put him on my Ameracuna gals for some color egg traits. 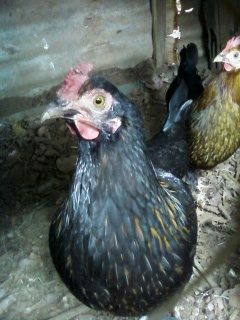 Pluma(SC) and Grunda(SC), are sisters and Alpha and Beta hens in this group. Their mother Grannie (RIP) passed in 2009. 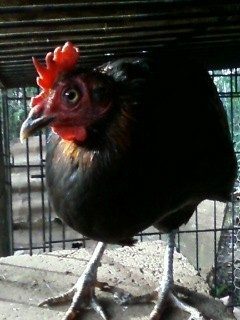 Grannie was a Bantam Black Cochin. These are her last two offspring before she passed. Pluma is quit pushy when she wants to go scratch outside. and will try to nuzzle her way past me when I open the door. She is a little larger than Grunda. Grunda is the smaller of the two and is the same size as Buffie. Grunda is clucky and does not like being held. She squirms everytime I pick her up. These two girls will wait for me to rake before they attack the critters that come out of the leaves. They are like their mother. The offspring of Pluma and R.C. They are only a couple weeks apart. I had two clutches to work with of various egg collections. 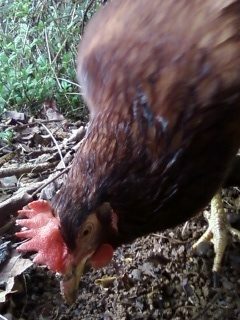 Rosie (RC) is skittish though when she was a baby she was fine with me stepping over and around her. 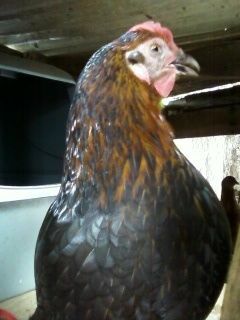 She is not a bad layer of pretty big eggs. She doesn't like to be held and will fuss if she has to be held or moved. 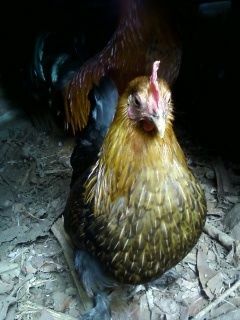 Rosetta (RC) is like her mom, but is more broody. She lays well and is quite sweet when being held and doesn't fuss. 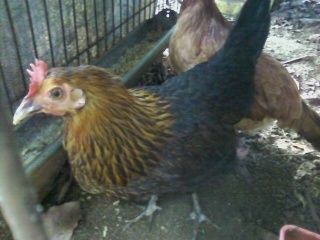 Lacie(SC) was given to me by a friend that ordered her and a bunch of other chicks online. She was giving some away when I was talking to her one day. I picked her up because she had a split bill and she didn't want her. I file it down because she has a double dagger other wise. R.C. (RC) is my lucky feral catch at my grandmother's House. 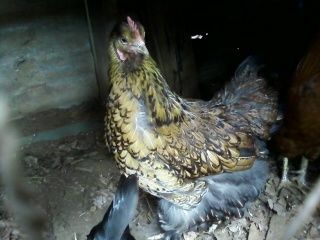 He was hanging around her coop and making her roo get agitated. 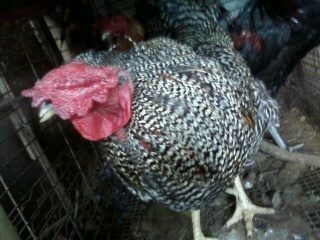 When i caught him I was surprised to find out that he was a Spangled Hamburg roo. I was like score!! I can't wait to get more kids especially another male like him. He has three kids Rosie, Rosetta, and R.C. He is my head roo in this flock but will be rotated out later for more unique crosses. This consists of the Hens, Dasha (SC), Limpie (SC), and lead by Blindy. Second in command is Cucka (PC). The roos are rotated out because it would be a conflict. Dasha is the offspring of Rosetta and Unkey. she had some kind of growth that was on her face that destroyed her eye. I treated it but it was too late. So she had to be placed in a cage that suits her. 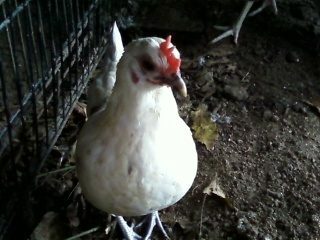 I also got a hen running around my Grandma's house. Limpie is visually impaired and has a limp in her leg. When I caught her I also noticed a bald spot. She is slightly larger than Dasha. 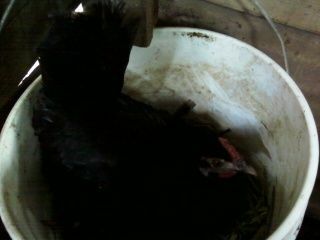 My Grammie said she would see her trying to get in her hen coop but new something was wrong with her. So I took her home and now she is Beta hen in that group. Cuka is still being analyzed because he is displaying aggression and my not be rotated in this month. He is a much younger roo to Blindy, but Blindy is kind of in retirement due to his age. I am unsure of his fertility but I think giving Blindy breaks help. But the changing of the guard is difficult when I try to catch him. (sorry only pic I had)He may be culled, I am still undecided. Update, Culled choce was desided due to a double attack from him and then from Varment. Shadow(SC) is literally his father's shadow. He got the blue feather trait from dad (Taiknetu). 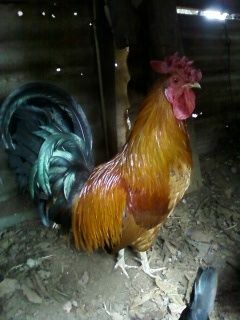 His mother is Witchie(SC) a BR hen, details later. They have the same built and stature, just the color difference. Shadow is just a Sweetheart! As a chick he and his sister, Nite, would jump on me and perch there, so cute. He would go by his father's coop and his dad would interact in a sweet way with him. Now that he is a flock male he tries to intimidate his dad. But a quick push from my hand and he stops and goes back to his gals. It is like he knows to stop when i do that. He has the same demeanor like dad and chills while his flock is out scratching. I think he is gorgeous!!! These four RIR gals were bought at the local feed store and fostered bu Creamie. I got them to replace Toesha (RIP). 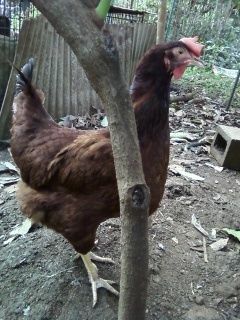 Mahogany (SC) is a large hen and miss thang of the group. She has a huge comb that flops to the side. 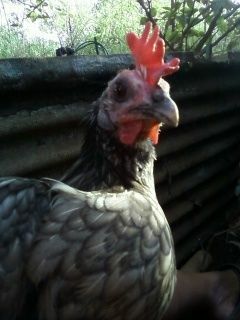 Scarlet (SC) is a passive hen in the group and very curious when I am sitting in front of the cage. or when I am peering in their nest to see if there is and egg. As chicks these two were the huge chicks in the group of four. Rubie (SC) is a late bloomer. she was the last to lay this year and took her a while to mature to adult hood. 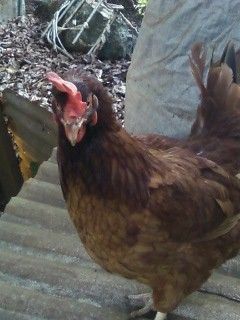 She likes to pick fights with any hen in that gets to close to their pen and rallies the other pen mates to intimidate the interloper by their house. She is sweet when I handle her and likes to be picked up. 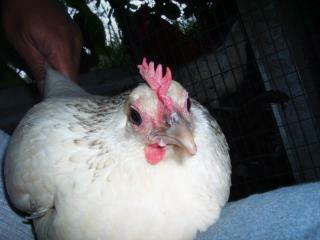 Suri(SC) is the odd ball I swear she looks like a production hen. But she was the first to lay in the group. Shadow likes her so much, that is his go to gal when it comes to the love game. These two were the runts or thew two but caught up to the other two in size.